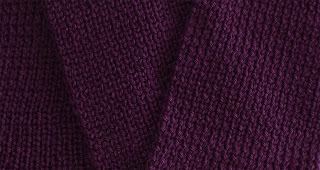 The name of this scarf was inspired by the color yarn I chose to use for this project; although it's referred to as 'grape', the color personally reminds me of Acai berries. 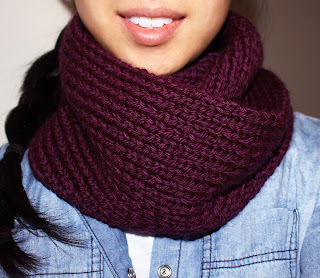 The entire scarf is just a 1x1 ribbed pattern, which can simply be completed with the knit and the purl stitch (watch the knit stitch 'how to' tutorial here, purl stitch tutorial here). I chose to use straight needles to create a long rectangular shape (like a regular traditional scarf), then just join the two ends together. Using one full skein (256 yds), the final measurements of my scarf ended up having a circumference of 44 inches and width of 5.75 inches. Money saving tip: If you decide to purchase your materials online, don't forget to shop through a cash back link. I most commonly shop through my Discover credit card cash back program or ebates. Ebates offers up to 4% cash back on amazon.com purchases (depending on the item category). You can sign up for ebates here; it's super easy & quick. Keep repeating this pattern for each row until desired length. I used the entire skein, which was a little over 200 rows. Using straight needles, I created this piece. Join/weave two ends together to create a circle/infinity scarf. You're still alive! Phew! I fell in love with ALL of your projects and then saw the last time you posted was last December ;-; Then I'm looking around for a scarf pattern, check around here again and see this! And the date! :DDDDDD Glad you're back! And I love the scarf!!! Hi Catherine! Thanks so much for commenting! Yesss, I AM still alive and knitting :D I wish I had more time to knit! I actually started this scarf LAST YEAR, forgot about it, and finished it this year :p I have a few other projects in the works, so hopefully you'll see more posts soon! It's great to hear that you are better and nearly caught up with school -- it's very hard to be fully caught up in school... everrr! Keep it up! Hi! I just stumbled upon your blog and love your projects! 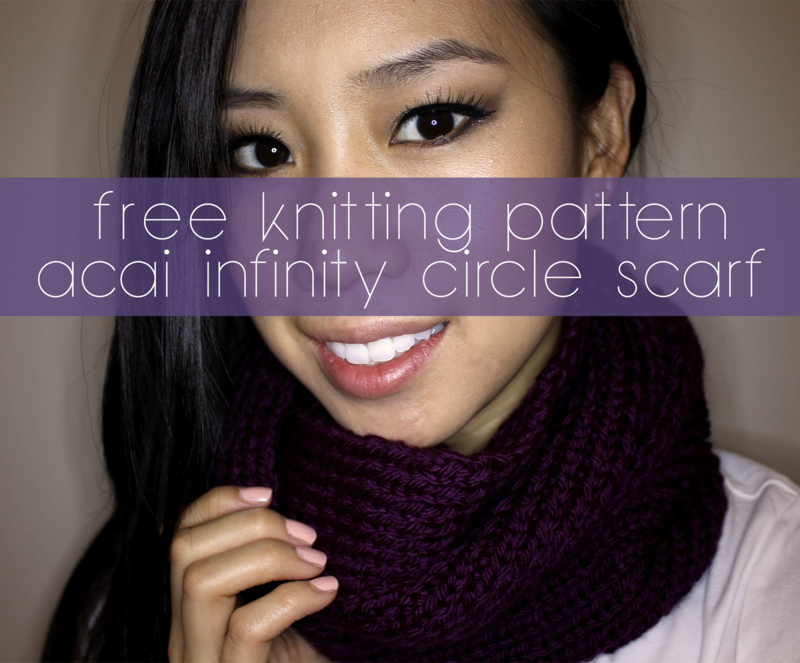 How do you sew two ends of a scarf together to create circle/infinity scarf? Thank you so much for taking the time to comment and happy holidays! Hi, did you have a problem with this scarf curling? Or was it just nice and flat after it was done? Nope! I did not have any issues with the scarf curling : ) it did not need to be blocked. The K1, P1 pattern will not curl. If you made a scarf with row 1 all knit stitches and row 2 all purl stitches and repeat, then it would curl and require blocking. Can this scarf be modified for a child's size - she's 8 yrs old? Hi! I'm excited by starting this pattern, but just wanted to know if 1 side is k1, p1, is the other side then also k1, p1 or the opposite (so p1, k1). Thanks! If you follow my pattern exactly and cast on 40 stitches, then side 1 is K1, P1 and side 2 will also be K1, P1 <-- this is the case if you decide to cast on an even number of stitches. If you chose to cast on an odd number of stitches (for example, 45 stitches instead of the 40 I did in my pattern), then your side 1 will be K1, P1 and your side 2 will be P1, K1 and repeat. I know in the pattern you said it's about 200 rows, how long does it approximately going to be? I use a slightly bulky yarn so I would like to know when to stop. Mine was about 40 inches in length / circumference. Since you will be knitting this up on straight needles, you can kind of carefully wrap it around your neck as you work up the project to gauge how it looks : ) hope this helps! 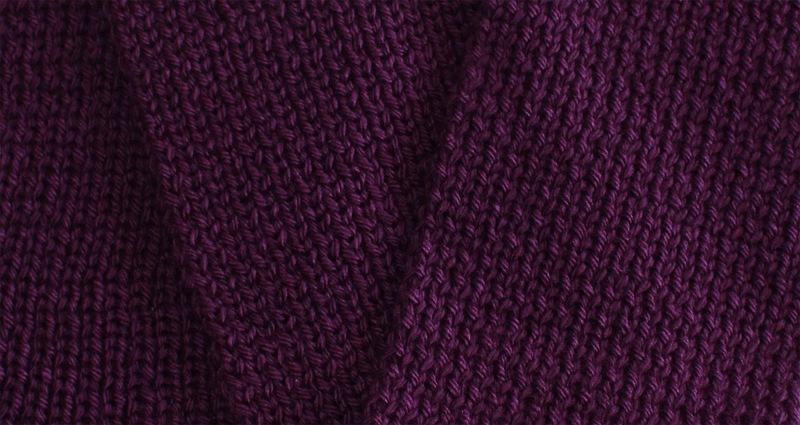 Can you use super bulky yarn for this pattern? Hi Lisa I want to knit a cardigan for men but I'm not sure what pattern to use could you suggest a pattern to me if you don't mind?? Should I be knitting the purl stitches and purling the knit stitches? Because I'm following the pattern but I keep knitting and purling the opposite stitches. I don't think you maintain this blog any more, but just in case, I wanted to say I'm so excited to try this as my first knitting project! I watched your cast on, knit, and purl videos on youtube, as well. So helpful!